I call this Spicy Gravy, (spicy tasty, not spicy hot!) my traditional gravy jazzed up with some groovy South East Asian style herbs and spices, just one taste of it and you’ll be wondering why haven’t I done this before?! Trust me! Can you smell it? Lemongrass, galangal, ginger, lime leaves et al – psychedelic rapture in a gravy boat! Essentially, for this Spicy Gravy Recipe, we are going to roast bones, wings and vegetables in a moderate oven, then cook/boil everything on the stove to reduce. I always have a batch of this in the freezer and for big occasions like Christmas, it’s made a day earlier and kept in the fridge. Then on the day itself, you add the juices from the roast when heating the gravy up and check final seasoning before serving. Easy peasy and no lemons required! For festive ideas, check out the Christmas Page. Heat oven to 200˚C/400˚F (180˚C/350˚F fan). Now, place the roasting dish on the hob on a low heat. Give everything a good stir, scraping the bottom of the pan. If dry add a splash of water and mix it all up. Add the flour and ginger and work it in to combine well. Leave it "cooking" for about 10-15 minutes to deepen the flavour even more. Turn the heat up, add the boiling water, lemongrass and lime leaves from B, stir and simmer on low heat for around 20-30 minutes until it's thickened to a gravy consistency. Check the seasoning then push everything through a sieve in to a clean jug or saucepan, squashing everything through the sieve with a large spoon. This can be the finished product. However as you've always got a roast going for the gravy, pour the strained juices from whatever roast you have into it and you'll have gravy to die for! As mentioned, this gravy can be made ahead and kept in the fridge overnight or even frozen. To serve, just add the juices from whatever roast you're having, a splash of port/sherry if you fancy and heat it up thoroughly. 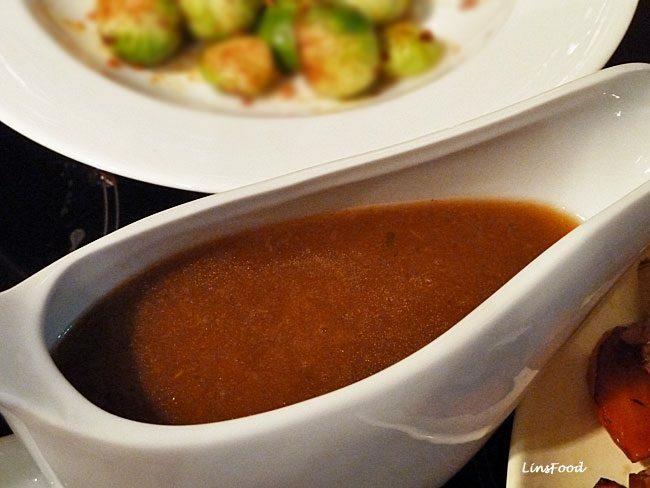 Wow, I think I do not need the turkey with this gravy…looks delicious and so flavorful! This gravy has it all! It must have been full of flavors and aromas! I can drink this gravy like a soup! Sounds so flavorful! Yum, Yum YUM!!! Lin, this is gorgeous! I gotta tell you that in our house, gravy is a beverage. We have a gravy yacht because a gravy boat is just not big enough. (No kidding! Ours is huge!) so this is perfect! One and a half – two liters of delicious, fragrant gravy is a like a dream come true. Happy Thanksgiving to you too! We have been so blessed this year. P.S. I love your blinking lights and falling snowflakes! This looks fantastic and a great idea during these holidays 🙂 I can almost smell the lemongrass, galangal and the lovely spices here!!Delish!! WOW! this looks incredibly delicious! galangal and lemongrass? seriously??? Love it! !